Licorice (Glycyrrhiza spp.) 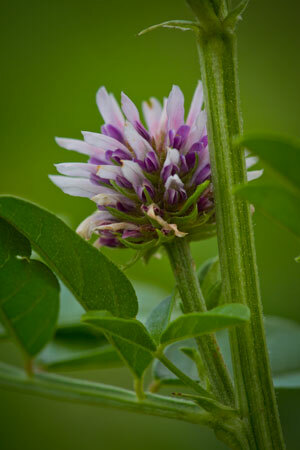 includes numerous species native to Europe, Asia and the Americas with only a few species currently used in medicine. The Greek physician Dioscorides derived the name from glukos (sweet) and riza (root). The roots contain glycyrrhizin, a triterpenoid glycoside about 50 times sweeter than sucrose. Glycyrrhizin inhibits the breakdown of cortisol to cortisone and thus potentiating its effects. Licorice benefits people suffering from adrenal fatigue and to reduce drug withdrawal symptoms from discontinuing prednisone. However, excess use (>20g per day) of licorice causes "pseudo-aldosteronism" because glycyrrhizin impairs the excretion of sodium and water loss leading to hypertension as well as potassium loss. Western herbalists recommend European licorice (Glycyrrhiza glabra) tea as a demulcent to soothe mucous membranes of the gastrointestinal (ulcers, heartburn) and respiratory tract (a cough, infections, asthma). Animal studies demonstrate that licorice contains licoflavone, a flavonoid that increases the prostaglandin PGE2 to stimulate mucus production. Deglycyrrhizinated licorice (DGL) lacks the steroid-sparing glycyrrhizin and therefore treats heartburn without the risk of hypertension. Licorice increases mucous production in the respiratory tract to help protect inflamed airways and also dissolve phlegm making it easier to expectorate. Research demonstrates glycyrrhizin has potent antiviral activity against several types of viruses, including Influenza A, SARS, H1N1, herpes (HSV) and hepatitis. Asian herbalists add Chinese licorice (Glycyrrhiza uralensis) to a significant number of herbal formulas to enhance the activity of other ingredients and improve the taste of decoctions. Although it possesses numerous medical properties, Chinese herbalist rarely prescribed it alone.